Hit an odd browser behaviour today. Trawling through some of those nice and dandy terms for a service (no I won’t tell) I followed a link and suddenly hit an “insecure connection” message from Firefox. Examining the certificate using the usual “openssl s_client” and “openssl x509” tools surely enough revealed that the served certificate didn’t include the second-level but only on the third-level www sub-domain. Strangely enough I discovered that when entering the same URL directly into the address bar of Firefox the connection was somehow redirected to the www sub-domain and loaded fine without any complaints from Firefox. Connecting to foo.bar (foo.bar)|127.0.0.1|:443… connected. Apparently Firefox’s behaviour in this scenario differs depending on the method in which the user is supplying the URL, in some cases silently ignoring the TLS/SSL warning. A little more experimentation revealed that it was actually not the source of the URL, link followed versus one entered in address bar, that made any difference. Instead it is the presence of a trailing slash on the URL that triggers the silent suppression of the serious red flag that the second-level domain asked to be fetched is not present in the served certificate. I was fooled by the fact that when entering URLs in the address bar Firefox suggests ending the URL on a slash (‘/’) if it is not already present. Manually removing this when editing in the address bar also makes Firefox display the security warning. Alas, the link I originally followed was also missing the trailing slash and behaved as expected by throwing me into a security warning. The whole “feature” of silently ignoring a security issue seemed very odd to me, but a bit of searching revealed that this was apparently championed by Google Chrome a couple of years ago. It is described in this servertastic post which also directs to a discussion on Twitter, with some key points replicated below, about its presence in Chrome and confirmation from a Chrome team member that the behaviour is intended. The thread ends with a guy who had dug up the source code of the feature in Chromium (on which Chrome is based) known as “SSLCommonNameMismatchHandling” in file browser/ssl/common_name_mismatch_handler.cc (see all mentions across code base). 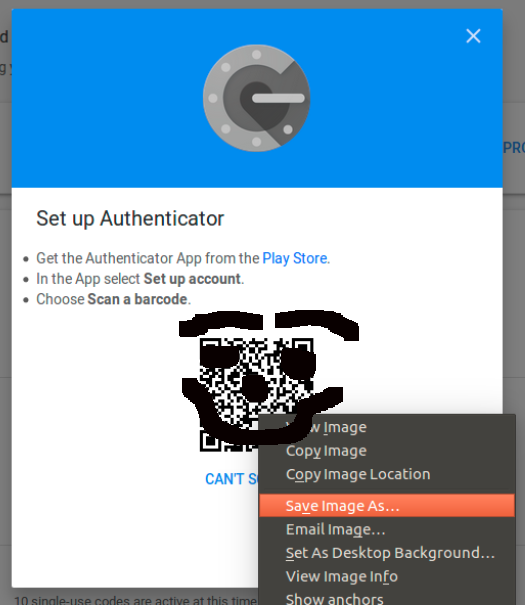 Below you’ll find an illustrated guide for freeing the authentication mechanism used by the Google Authenticator app for Android or iPhone for use on your favorite device (anywhere an implementation is available). In fact the Authenticator is using a standards based 2FA (two factor authentication) scheme defined by OATH (Initiative for Open Authentication) and published in RFC6238 dubbed TOTP – Time-Based One-Time Password Algorithm (more Authenticator background and it’s basis HOTP). This is a rather fine contraption but Google doesn’t advertise it very loudly being a standard instead locking the generated TOTP secret into a QR code that they will only imply are for use by their own Google Authenticator. That is not true as a host of alternative Android OTP apps are compatible and can read the QR codes as they are based upon the Authenticator’s legacy as an open source application which Google took private. Login to your Google Account (maybe using the authenticator?) and go to Account -> Security -> Signin -> 2-step verification. Locate the “Authenticator app” section and Click “CHANGE PHONE” (really “CHANGE TOTP SECRET”). Right click the QR code image, select to save it and put it somewhere you can find it (~/Google_TOTP_QR.png might be sensible). Install the QR-code decoder zbar for extracting the TOTP secet from the image and the OATH toolkit oathtool for generating future TOTP passwords using it. On Debian/Ubuntu this can be done by installing the packages zbar-tools and oathtool. “491293” being the password, having a default validity of 30 seconds (called step size because of the counter based nature of the HOTP behind it). Also see the dongleauth.info website for a list of other sites supporting TOTP and U2F. Be sure to delete the QR code image when finished, and seek out a suitably secure place to store your TOTP secret. One solution could be using PGP encryption, maybe even through some clever management system such as pass. Also educate yourself of the shortcomings of TOTP/HOTP and consider studying and using the FIDO U2F standard and related devices.